Here's the newest offering from RyJ Cigars, the 1875 Romeo y Julieta. I picked this Gordo up on my last visit to Cigar Train. I like the consistency of RyJ Cigars so I am pretty excited to give this 1875 a try. 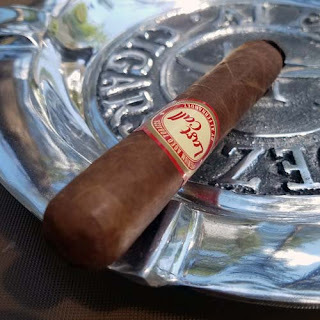 This 1875 Romeo y Julieta Gordo comes draped in a silky smooth, seamless, nearly vein free, Colorado Claro colored, rare 2010 Indonesian wrapper. From the foot, the aged Dominican Piloto fillers had light notes of fermented tobacco to the nose and once the cap was clipped the free draw had notes of spiced fruit. After putting a flame to the foot, the cigar rewarded me with large mouthfuls of smoke tasting like fruit and cream with a dash of black pepper mixed in. The pepper quickly faded as flavors of earth, leather and sugar took over. After eighty minutes the cigar finished with medium bodied nuances of leather and cream. The flavor mix of this 1875 wasn't very complex, but the cigar delivered a smooth and tasty smoking experience. Over all this was a nice cigar. It smoked cool full length, the burn line was razor sharp, it's packed well full length and the wrapper picked up an oily gloss as the burn progressed. One final note, you won't find this cigar on-line, it's only available from brick-and-mortar stores. With a price point under seven bucks for a Gordo, I will get off my Cheap Ash and pick up a few more for the humidor!